Week 5 in ModPo was hectic. With the theme of Anti-Modernist Doubts, it covered Communist Poets of the 1930s, Haarlem Rennaissance Poets, Robert Frost and a brief look at post-war neo formalism. 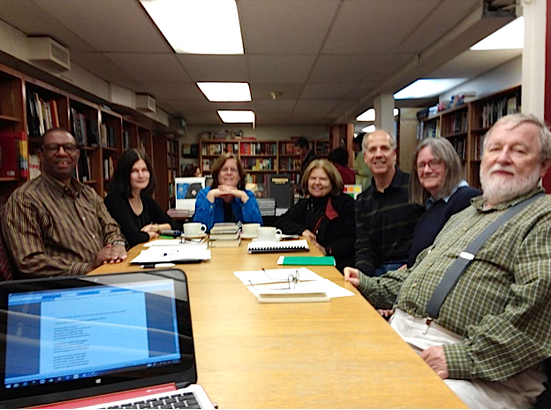 Poets discussed during this week were Ruth Lechlitner, Genevieve Taggard, Countee Cullen, Claude McKay, Gwendolyn Brooks, Richard Wilbur, X. J. Kennedy and, as mentioned, Robert Frost. It was all fascinating, but one line of discussion caught my attention, and that was in relation to Robert Frost’s poem, “Mending Wall’. The story of this poem is of two neighbours who meet once a year to mend an eroding wall between their two properties – to build it up again. They each stay on their own side of the wall, walking along the wall and repairing it. The speaker’s neighbour believes that “Good fences make good neighbours” …. for the relationship to be good, they have to keep separate – there is a necessary distance between people and we try and connect through the gaps. The suggestion in the discussion about this poem was that the two neighbours are both Robert Frost. One side of Robert Frost is conservative and wants to stick with tradition, keeping the wall up, keeping everything as it has always been, keeping the distance between neighbours, mending the wall when it begins to crumble, and preventing the chaos that might ensue if the wall was allowed to come down. This side of him liked formal restrictions, rules and the distinction between “I’ and “Other”. The other side of Robert Frost, is the frost itself that does the eroding, that consciously tries to bring the wall down, that wants things to change and nature to take its course, that believes that the natural state of boundaries is that they erode. This discussion reminded me of Etienne Wenger’s work on landscapes of practice and working at the boundaries of communities. I remember him saying that learning can be very effective at the boundaries of communities, i.e. 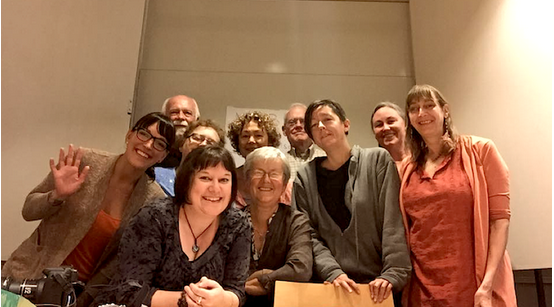 if you can straddle communities having feet in more than one community of practice at a time. Robert Frost’s poem suggests to me that it’s a question of balance – we need a bit of distance away from the boundary (i.e. more towards the core of a community of practice, or your own personal and individual ‘space’ for solitude and contemplation) but also the opportunity to meet across boundaries and to work collaboratively at boundaries, for at least some of the time. Finally, Al Filreis raised the interesting point that in New England walls were not originally built with the intention of marking boundaries, but to get rid of glacial boulders from the earth, so that the soil could be tilled. Walls were formed when stones and boulders were moved out of the way for agricultural purposes. I suspect there’s a lot that could be read into this. We seem to live in a world where we will naturally and sometimes unintentionally build up boundaries, but they will naturally erode with time, unless we consciously maintain them. Sylvia Currie who manages the SCoPE community at BC Campus spoke to FSLT13 last week on her work as a community facilitator and organizer. A community of practice is a fairly well-bounded local entity which has clear boundaries and membership criteria. A community of practice has a single center of supreme skill and authority, typically embodied in the master. A community of practice is characterized mainly by centripetal movement from the periphery toward the center, from novice to master, from marginal to fully legitimate participation;opposite centrifugal movement may occur but is not foundational. But things have moved on since those early days of communities of practice. 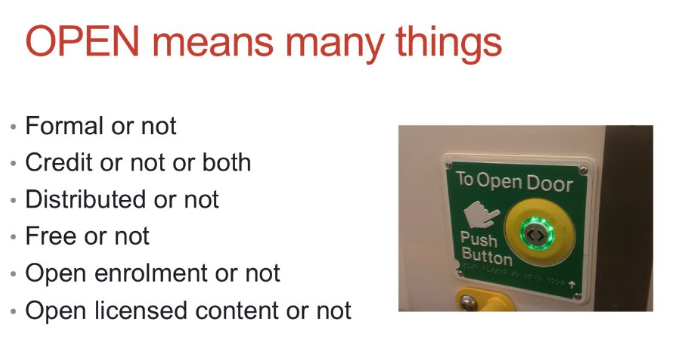 Sylvia points out that the term ‘open’ can have different meanings. 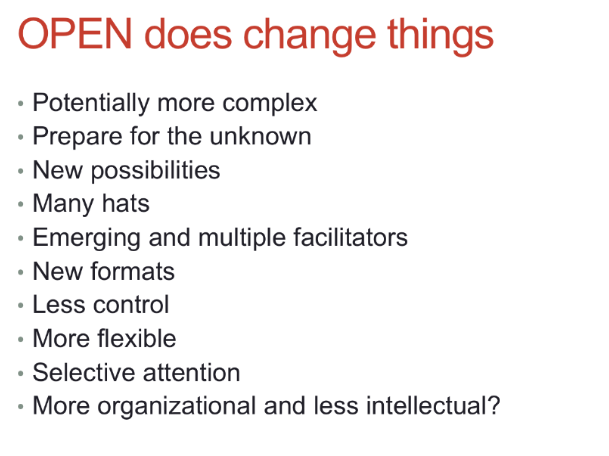 Etienne Wenger acknowledges this change in openness in his more recent work on ‘landscapes of practice’ where he discusses how we are members of different communities of practice and situated in multiple landscapes. The human world can be viewed as a huge collection of communities of practice – some very prominent and recognized, others hardly visible. Our learning can then be understood as a trajectory through this landscape of practices: entering some communities, being invited or rejected, remaining visitors, crossing boundaries, being stuck, and moving on. In such a landscape, both the core of communities of practice and their boundaries offer opportunities for learning. He has suggested that learning is often most profitable at the boundaries between different communities, recognizing that community boundaries are permeable. The SCoPE community is ‘open’ in many senses of the word and Sylvia has recognized that ‘openness’ changes things and requires a different approach in terms of facilitation. And here is a link to the complete recording in Blackboard Collaborate, including the chat and an example, in the second half of the session, of how to manage group work in a synchronous online session. Sylvia points out that this is not without risks, so not everything worked out, but if no-one took these risks then where would be the progress? Sylvia’s talk reflected her wealth of experience (more than 20 years) of community facilitation and her commitment to open sharing of her expertise. Engeström, Y. (2007). 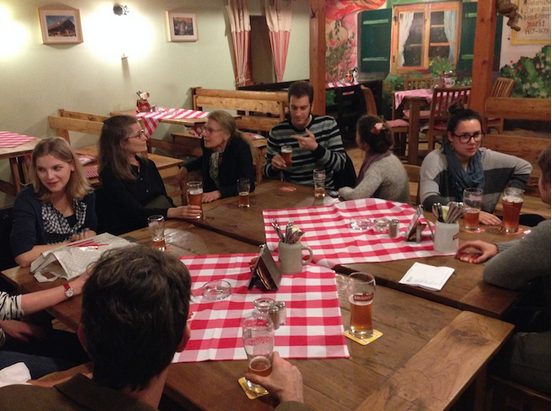 From communities of practice to mycorrhizae. In J. Hughes, N. Jewson & L. Unwin (Eds. ), Communities of practice: Critical perspectives. London: Routledge. 1. Are there practical benefits of studying the biological evolution of cooperation? To what extent does it provide insights that convert into theories and practices that can be used in formal or informal communities and organizations? 2. What other heuristics can we extract from the material and use as simple rules of thumb for extending cooperative interactions in the world? I chose these questions because so much of this course is theoretical and there ought to be some juicy practical suggests from a group like this in regard to heuristics for encouraging cooperation. Are there practical benefits of studying the biological evolution of cooperation? To what extent does it provide insights that convert into theories and practices that can be used in formal or informal communities and organizations? In considering the first question it seemed to me that it would be easier to answer from the perspective of a specific context, and the context of a community of practice seemed appropriate, given that you might expect plenty of cooperation in such a community, if not collaboration. By community of practice, I understand this as defined by Etienne Wenger in his 1998 book – where he defines a CoP as having three clearly identifiable characteristics; a domain, a shared practice and a community of members – who participate in the community through mutual engagement, joint enterprise and shared repertoire. In thinking about what we might learn about cooperation from a community of practice, I have considered the scenario of a long-standing and successful CoP coming under the threat of ‘extinction’, i.e. changing circumstances within the community threaten its continued success. A consideration of how the community might be competing for survival – competing against other online environments for members’ time, competing against members’ diverse and dispersed interests and motivations, and possibly membership of other communities. Does this community pay enough attention to the challenges of competition? Is the community group strong enough/big enough to fend off the pull of other groups/communities? Is there enough ‘social grooming’ in the community? Does Robin Dunbar’s number inform the community’s future success? Is there enough ‘gossip/communication/interaction’ to establish reputation, prestige, trust and norms? Is there a common community understanding of value associated with future outcomes? Is there a role for fairness and punishment in the community? Is the community worth saving in terms of what it can pass on to future generations? Are there simple rules of thumb for extending cooperative interactions in the world? For me, it is not possible to be more specific than this without knowing the context. Note that none of this resembles collaboration (much less competition). It occurs at a midway point, where there is interaction and exchange, but not a melding into a single unity. Cooperation – not collaboration – is where we should trace the future of learning online. I am thinking about whether I agree with Stephen about collaboration. I need to think more about when melding into a single unity might be beneficial. Are there examples from biology where this is the case (Lynn Margulis’ work on endosymbiosis springs to mind) and if so, what can we learn from this? and the readings on Howard Rheingold’s course site. There are just two more days to catch the early bird registration for BEtreat. There are three alternative types of BEtreat on offer, which I blogged about here. Last year only one was offered, which I attended face-to-face in California – a unique and unforgettable experience – and one I am still learning from. 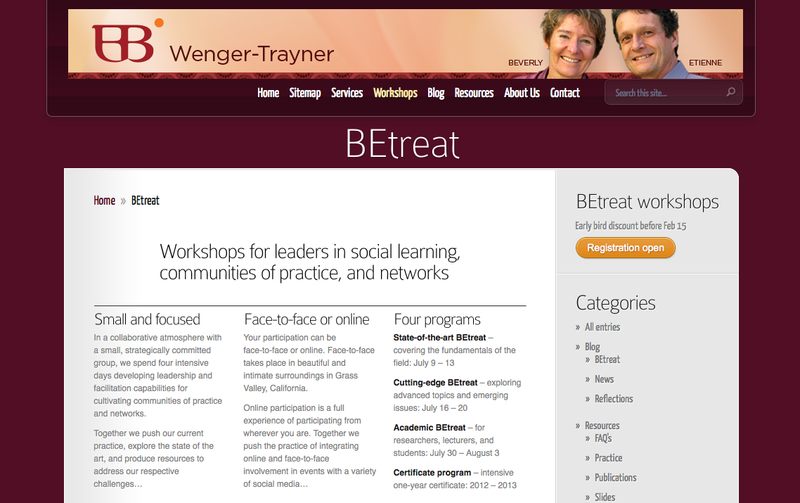 This year I have signed up for the Academic BEtreat as an online participant. The focus on key concepts and social learning theory will fit very well with a project I will be working on later in the year, and I am really looking forward to experiencing this as an online participant – from the other side so to speak. In 2011, I was very fortunate to be able to attend BEtreat, in the home of Etienne and Bev Wenger-Trayner in Grass Valley, California. This was a unique and unforgettable experience and one that I am still reflecting on and learning from. ‘In a collaborative atmosphere with a small, strategically committed group, we spend four intensive days developing leadership and facilitation capabilities for cultivating communities of practice and networks. Together we push our current practice, explore the state of the art, and produce resources to address our respective challenges. BEtreat is a hands-on, practice-oriented gathering of network and communities of practice professionals, who work closely together in a collegial learning environment. The number is kept small so that we can address in depth the specific issues and challenges brought in by people who are there. We end these four intensive days of working and learning with a party. This year Etienne and Bev are offering three different BEtreat workshops in 2012 and starting a one-year certificate as a professional development program. Participation can be face-to-face or online, but for an early-bird discount, you need to sign up before Feb 1st. A predominant feature of BEtreat was the impact of context and culture on the learning process. There was an expectation that we would share our experience of communities of practice with a view to learning from each other. However, whilst the sharing was easy enough, the understanding of where people were coming from was more difficult. Participants came from very different backgrounds. Large corporations such as Shell, Deloitte and Microsoft represented the ‘for profit’ sector and within the ‘not for profit’ sector there were those who were working with many communities across large geographical areas and those who were working with much smaller more localised communities. The disparity in the amounts of funding received by these different communities was huge. These differences in contexts led to mismatches of understanding of what we mean by communities of practice and also to different uses of language. I found myself listening to conversations which were quite unlike the types of conversations I usually have about communities of practice and I’m not sure that I ever did really understand what the other participants were doing with their very different communities of practice. There was a lot of ‘talking past each other’. On reflection it might have been helpful to go further than the descriptive sharing that we did, most of which was not relevant to other contexts, and instead focus on analysing the culture of the different communities with a view to understanding them better and being able to better make comparisons. One possible useful approach to analysing culture is the ‘Culture Web’, which Julia Balogun writes about in her article ‘Strategic Change’ in Management Quarterly Part 10 January 2001. This captures, through stories, symbols, routines, power structures, controls and organisation structure (see p.5 of the article), what the central paradigm of a culture is. If context influences how communities of practice are understood, then could we argue that an understanding of this central paradigm is needed? Maybe this would have helped us to better understand each others cultures and the different issues that each of us are facing in our work with communities of practice. Etienne Wenger talked to us at BEtreat about learning in a landscape of practice and working on the boundaries between communities of practice, so that we can find new ways to talk across boundaries. At BEtreat the boundaries between the different practices were very evident and, I think, problematic. It was said that there is a need to manage cross boundary working. For me, sharing practice was not enough. We needed to analyse and question the different cultures and it might have helped to use an approach such as the Culture Web. That said, it was very stimulating to be able to work alongside people I would never normally come in contact with and the experience has caused me to further reflect on Etienne Wenger’s work on landscapes of practice.